Shalom Hartman Institute Founder Rabbi Prof. David Hartman was a leading thinker among philosophers of contemporary Judaism and an internationally renowned Jewish author. He died Feb. 10, 2013. Born in 1931 in the Brownsville section of Brooklyn, New York, David Hartman attended Yeshiva Chaim Berlin and the Lubavitch Yeshiva. In 1953, having studied with Rabbi Joseph B. Soloveitchik, he received his rabbinical ordination from Yeshiva University in New York. David Hartman continued to study with Rabbi Soloveitchik until 1960, while pursuing a graduate degree in philosophy with Robert C. Pollock at Fordham University. From his teacher Rabbi Soloveitchik, David learned that the practice of Judaism can be integrated with a deep respect for knowledge regardless of its source. From Professor Pollock he learned to joyfully celebrate the variety of spiritual rhythms present in the American experience. David Hartman's work emphasized the centrality of the rebirth of the State of Israel – the challenge as well as the opportunities it offers to contemporary Judaism. His teachings drew upon the tradition of Orthodox Judaism and emphasize religious pluralism, both among Jews and in interfaith relations. 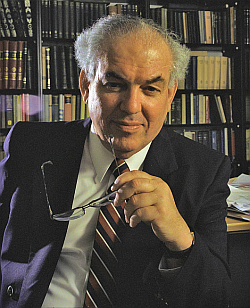 David Hartman’s publications in Jewish philosophy received wide recognition and become standard references in academic scholarship. He was awarded the National Jewish Book Award in 1977 for Maimonides: Torah and Philosophic Quest (Jewish Publication Society, Philadelphia, 1976) and in 1986 for the reissued A Living Covenant: The Innovative Spirit in Traditional Judaism (Jewish Light Publishing, Vermont, 1997). In 1993, the Hebrew translation of A Living Covenant (From Sinai to Zion, Am Oved Publishers) was awarded the Leah Goldberg Prize. A Heart of Many Rooms: Celebrating the Many Voices Within Judaism was published by Jewish Lights Publishing in 1999. Israelis and the Jewish Tradition: an Ancient People Debating Its Future published by Yale University Press, 2000, Love and Terror in the God Encounter: the Theological Legacy of Joseph B. Soloveitchik published by Jewish Lights 2001. The Hebrew translation of Israelis, and the Jewish Tradition - Moreshet B’Machloket was published by Schocken Publishing House, 2002. Sub Specie Humanitatis, an Italian translation of A Living Covenant, was published in 2004. The God Who Hates Lies, written in collaboration with Charlie Buckholtz, was published by Jewish Lights in 2011. From Defender to Critic: The Search for a New Jewish Self(Back to top), was published in 2012.